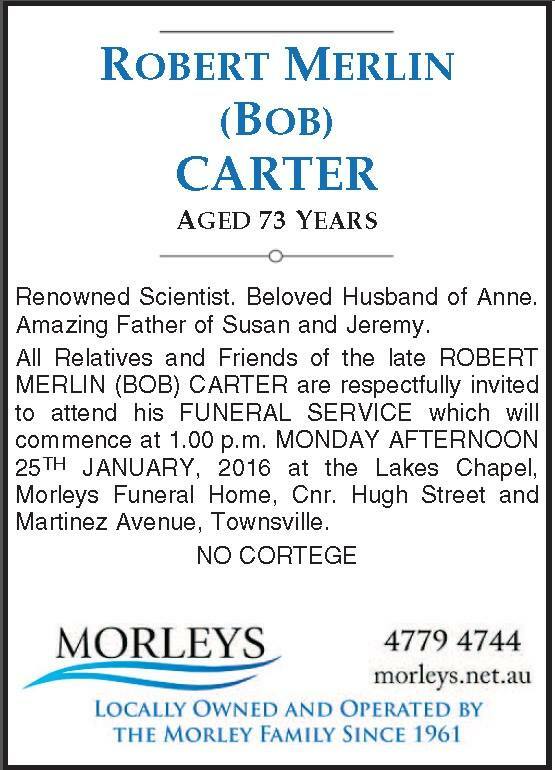 On the northeast coast of Australia, near the Great Barrier Reef, in the community of Townsville, relatives and friends are gathering today to pay their last respects to geologist Bob Carter. Half a world away, here in snowy Canada, I too am remembering him. Last month, when we both spoke at an event showcasing alternative climate perspectives, Bob seemed a decade younger than his 73 years. Full of energy and wit, there was no suggestion that the final weeks of his earthly sojourn were counting down, that a heart attack was about to end his life. In recent years, I’ve met several scientists worthy of admiration. Swimming against the tide of conventional climate wisdom, ostracized by former colleagues, libeled viciously on the Internet, I’ve been impressed by their perseverance, lack of bitterness, and good humour. All of this is true of Bob Carter, and much more. Bob was a superb communicator. He had the gift of making complicated scientific issues comprehensible to lay people. The first time I heard him speak, at a Washington D.C. event in 2009, he was one of two dozen presenters. Calm, bearded, bespectacled, he’d spent 24 hours in transit in order to deliver a 15-minute talk reminding us that climate is a local experience. Obsessing about a theoretical global climate – as activists and politicians are wont to do – ignores real people’s lives. Bob’s manner and arguments that day convinced me the media wasn’t doing a proper job. A public that has heard Al Gore’s climate views but not Bob Carter’s is a public that has been spectacularly ill-informed. Several months later Bob consented to read a draft of my 2011 exposé of the Intergovernmental Panel on Climate Change, providing helpful feedback and a blurb for the back cover. In 2012, when I did a four-city Australian speaking tour, he attended two of those events, even though they weren’t anywhere near where he lived. In 2014, when I testified before a committee of the UK House of Commons, members of that committee were rude to me during the televised session. The next morning I awoke to find a sweet note from Bob in my inbox, expressing indignation at their less-than-classy behaviour (our last e-mail exchange had been six months earlier). A scientist to his very core and a scholar, who shone his light on his students and those with whom he worked, Bob was no ordinary Professor. A world renowned geologist who worked on many of the big issues in geological measurement and analysis, as well as the small local problems, he gave of himself in every way possible. I was lucky enough to work with Bob on several projects over many years and his wealth of knowledge about marine and sedimentary geology was just mind-blowing…I will miss his support and encouragement and his skeptical attitude – even towards our own research. We would double and triple test our ideas and datasets to make sure that the interpretation [was] sound. That was Bob. I contacted Bob Carter a few years ago…This wonderful man, busy as he was, took the time to email me back with lucid explanations and an extract from one of his books…It was clear, concise, scientific and fully comprehensible to me, a middle-aged dame who grew up in the Queensland bush…His generosity in taking the time to communicate so thoroughly and warmly with me, a total stranger from the boonies, was simply astounding and so very much appreciated. intelligent courage, perceptive kindness and an exuberant love of life. Here was a man who…seemed to have a loving embrace for us all. I have little patience for sentimentality and for the glib, fake praise that’s too often uttered at funerals. But Bob really was an extraordinary human being. Quietly leading by example, he blessed our lives. He will be missed by hundreds of thousands of people like me; people that he never even knew. Joe Bast: Dr. Robert M. Carter, R.I.P. This entry was posted on January 24, 2016 by Donna Laframboise in books, ethical & philosophical, media and tagged Bob Carter.